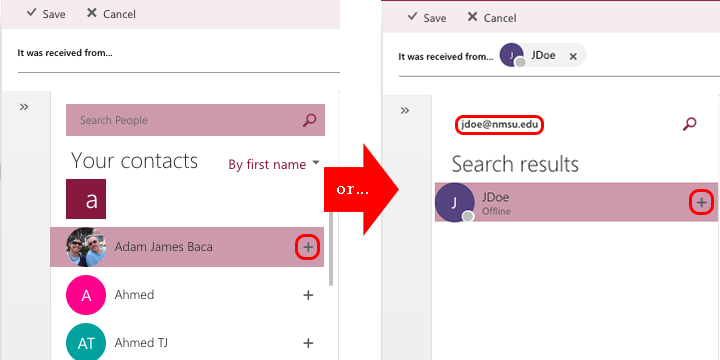 Using the Outlook web application through a browser you have the ability to create new mailboxes, for incoming and outgoing mail, as well as assign Rules to these boxes. These Rules allow you to organize where your messages can be found quickly and easily. 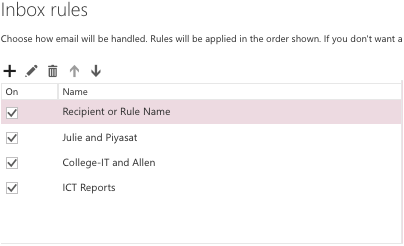 This document will assist you through the process of assigning new Rules to your Inbox using the Outlook web-based application. Note: Before you begin this process please sign into your Outlook email via a web browser of your choice. The images used in this document were taken using the Chrome browser. 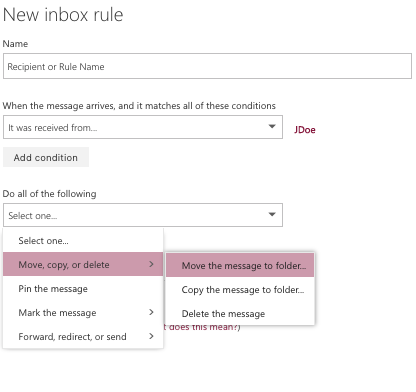 Before you create a "New Rule" you will need to create a new folder, in your Inbox, that can be used later in this process. Navigate to the Plus Sign to the right of the name above your "Inbox" and click. This will create a new folder in your Inbox which you will need to name before continuing. Navigate to the upper right corner of your window and click on the cog to display the Settings menu. From here, navigate down to the bottom of this menu and click the Mail option under the "Your app settings" submenu. Once the menu has loaded, click on the Inbox and sweep rules option. 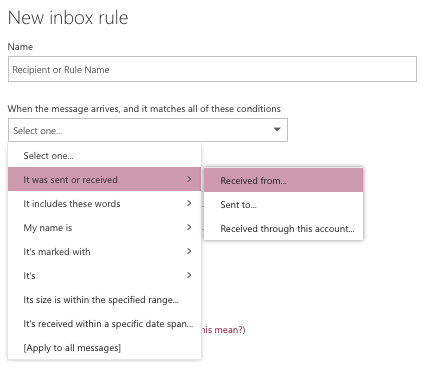 Once this panel has opened click on the plus sign under "Inbox rules" to create a new rule. From the "New inbox rule" panel, you will need to begin by typing in a Name for this rule. Next, click to expand the menu under "When the message arrives, and it matches all of these conditions". From here hover over the first option, "It was sent or received" and select the Received from... option. Once the "Received from..." option has been selected a new menu will open where you can choose an email address that will correspond to this rule. From this menu, you can either select a contact from "Your contacts" by clicking on the plus sign next to their name or type an email address into the "Search People" bar if the intended address is not listed. Note: If you manually enter an email using the "Search People" bar you will need to click the plus sign next to the result displayed. Additionally, you can add as many emails through this method as you like. After you have added all the emails/contacts to this rule click Save, found at the top left of this window. After you click "Save" you will return to the "New inbox rule" panel. Expand the next menu titled "Do all of the following", hover over the "Move, copy, or delete" option, and click on the Move the message to folder option. From the "Select folder" panel, navigate to the folder that you created in "Step 1", click on it, and select the OK button to continue. You will be returned to the "Recipient and Rule Name" panel. 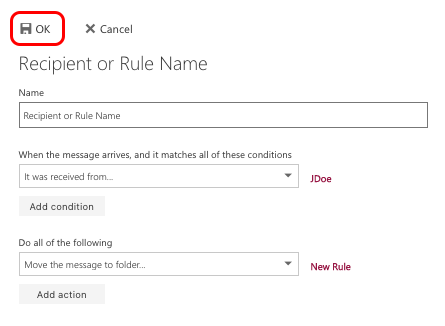 To create the Rule that you have just created navigate to the top left of this panel and click OK. You should now see the rule name listed under "Inbox rules". Your rule has now been applied!